(Newser) – In recent days, beachgoers in North Topsail Beach and Surf City in North Carolina have been stumbling upon some rare teeth—some the size of an adult hand—which belonged to a supersized prehistoric shark called a megalodon. Aurora Fossil Museum experts say Hurricane Joaquin likely dredged up the previously undisturbed fossils, and rain and high tides have helped bring them to the shores of an area already known as a popular spot for gigantic megalodon teeth, reports Australia's News Network. Who knows what still lurks in the deep recesses of the oceans. Going to Surf City 'cause it's two to one. 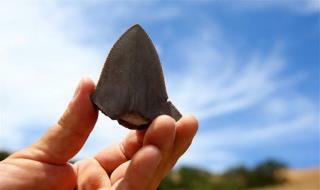 Megaledon teeth have been washing up on beaches in Virginia and North Carolina for years. There are cliffs along the Chesapeake Bay that have been thrilling fossil hunters for decades. A mastodon was recently unearthed too.